The first touchdown of Grey Cup week took place on Tuesday at about 5 p.m. MT, with the Ottawa REDBLACKS’ arrival in Edmonton. That was the only TD that the day would see. The Calgary Stampeders realized they were in a short yardage situation and made the smart call, chartering a bus up to Edmonton, where they’ll look to put all talk of their oh-fer streak to bed for good. Business will pick up on Tuesday with the annual coach’s media conference and before you know it, you’ll be in the stands at Commonwealth Stadium or hunkered down in front of your TV for the biggest Canadian sporting event of the year. Before this week unfolds in fast-forward, here are five things to keep an eye on for the game. Jonathan Rose: Will he or won’t he? 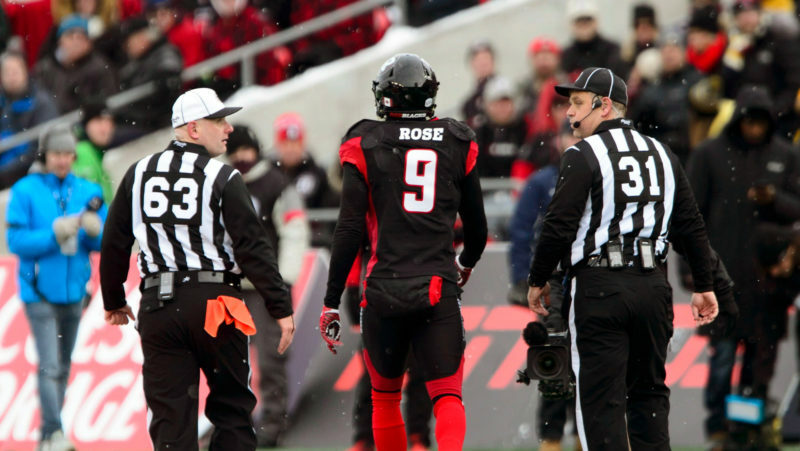 Rose, who tied for the team and lead-league with five interceptions this season, was suspended for the 106th Grey Cup presented by Shaw on Tuesday morning, after pushing an on-field official during the Eastern Final. The CFLPA has filed an appeal on his behalf, with the final decision to be made by an arbitrator. If the decision can’t be reached before kickoff, Rose could be eligible to play, or have his eligibility left to the discretion of the REDBLACKS. Coach Rick Campbell didn’t want to get into they hypotheticals on Tuesday. If Ottawa is without one of their top defensive backs, it’s a big blow for a strong defence. There may not be much said publicly about it this week, but Rose’s status will linger over the game all week. Bo Levi Mitchell could be looking at the NFL after this season. So could Alex Singleton. Defensive coordinator DeVone Claybrooks will almost certainly have teams approaching him once this season is over about a head coaching job. Then there’s free agency, which threatens to throw rosters in a blender like a weird video game feature. Then there’s that oh-fer streak mentioned earlier. The Stamps have been the team to beat in the CFL for essentially a decade. What’s its legacy if it loses out on a third Grey Cup in a row? What if next year’s team is completely different? The Stamps need to appreciate this (possible) final opportunity in front of them. Can the REDBLACKS do this again? No one expected the REDBLACKS to give the Stamps a game in the 2016 Grey Cup. They not only took the game to Calgary, they took a championship from them, winning a Grey Cup in just their third year of existence. With the West’s dominance the last few years, the East champ has consistently gone into the Grey Cup game an underdog. Given their history and Calgary’s late-season struggles this year, that will be less the case this time around. Another Grey Cup win — this would be two in three years in just five years of existence and will mark three appearances in the big game — would go a long way toward silencing the notion that the REDBLACKS are just as good as their Western counterparts. The questions have always lingered around Trevor Harris, even when he was in Toronto battling Ricky Ray for a starting job. Is he a true starter? Is he a big game player? Can he truly carry a team? He answered everything in resounding fashion in the East Final, throwing a CFL playoff record six touchdowns as part of a 367 yard, performance with a 90.6 per cent completion rate (that I like to think is a tip of the hat to Ray). Look back on his season, where he racked up 5,116 yards and a league- best among starters 70.1 per cent completion rate. He’s been trying to answer the questions all season. Now, with a nation watching, he’ll try to finish the job. We saw what Harris can do when he has time to operate. What about when it’s the opposite? As The Great Don Landry pointed out to me on Tuesday, Calgary’s defence loves to pour the pressure on quarterbacks. So what’s faster? The rush or the release? Harris was sacked seven times in the REDBLACKS’ two losses to Calgary this season. His o-line will have to give him more time to operate if they’re going to have a shot at pulling off their second Grey Cup win over the Stamps.